TAMPA, Fla. - April 3, 2014 - PRLog -- Brandon Honda has been named a winner of the prestigious annual 2014 Edmunds.com Five Star Dealer Award given to only the top 1% of all car dealers nationwide for best overall customer service based on actual customer reviews. “Thanks to all of our customers who have honored us with your business and have taken the time to write a positive review at Edmunds.com about your buying experience here at Brandon Honda,” said co-owner John Marazzi. “Our team is laser focused on treating our guests with the respect and courtesy they deserve. We take great pride in exceeding their expectations." Edmunds.com has quickly become one of the most trusted, on-line review sites because it proactively takes steps to ensure its website user-generated content is authentic and as trustworthy as its professional car reviews, dealership inventories, and consumer advice. 18 million visitors a month use Edmunds' shopping tools to connect with over 9,500 dealer franchises across the United States. 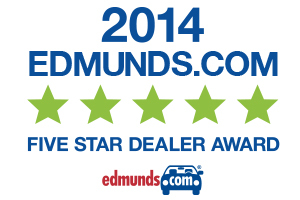 Edmunds.com has posted this year's winners at http://www.edmunds.com/2014-five-star-dealers.html#Florida. Brandon Honda works hard throughout the year to improve every aspect of its customers’ approval and satisfaction with its sales and services. Its internal program of “Continuous and Never-ending Improvement” empowers every employee to continually seek dealership and process improvements to ensure extraordinary customer services. Brandon Honda is located at 9209 E. Adamo Drive in Tampa, FL 33619, one mile west of I-75 on Route 60. For more information, call 813-664-1234 or visit http://www.BrandonHonda.com/. : Dolan Marketing Services Inc.